Both these sides have been to Norwood with one goal in mind in the past 15 years or so. Who will have a winning goal in mind this week? 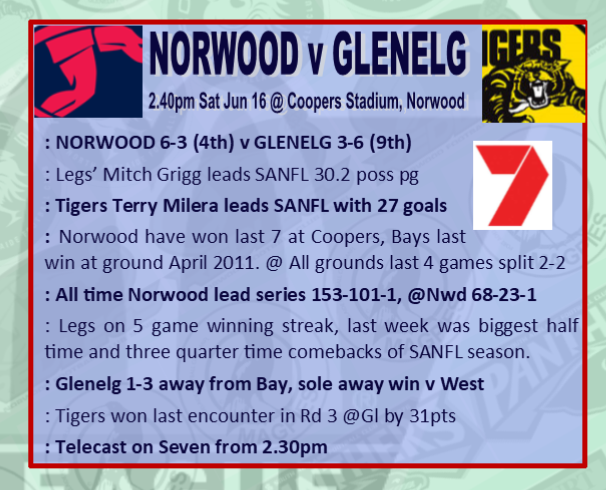 Norwood by 31 but if Glenelg can bring a pressure game and play near the best might cause a close upset. Didn't really look like winning. The Bays tried hard and competed all day but Norwood were a bit too good for us. Apart from the first quarter which was even, the Bays didn't ever seem that they could control the game and were basically relying on Norwood to slow up or make mistakes.